determine the precise position of center of mass, , along radial vector . 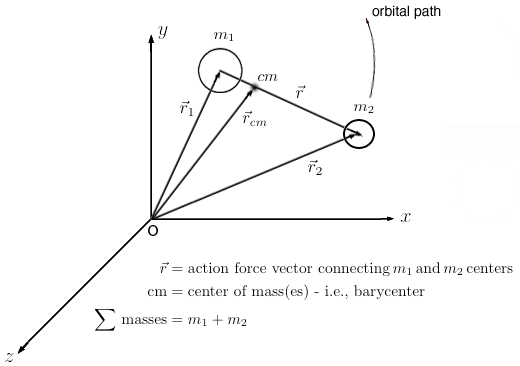 If, on the other hand, is a small mass relative to such as an artificial satellite put up around a much larger planet or moon, the above equation for combined mass indicates that the barycenter of the 2 - body system effectively becomes the center of mass of the much larger mass body! "The 55 Cancri Planetary System: Fully Self-Consistent N-body Constraints and a Dynamical Analysis ", by B. Nelson et al., pub. journal Monthly Notices of the Royal Astronomical Society, early online edition April 22, 2014, mathematical astronomy team led by Penn State University graduate student Benjamin Nelson in collaboration with faculty at the 'Center for Exoplanets and Habitable Worlds' at Penn State and five other astronomers from other institutions in the United States and Germany. Mysteries of a nearby ( only 39 light years away ) planetary system's dynamics in the Constellation Cancer are therefore now solved! 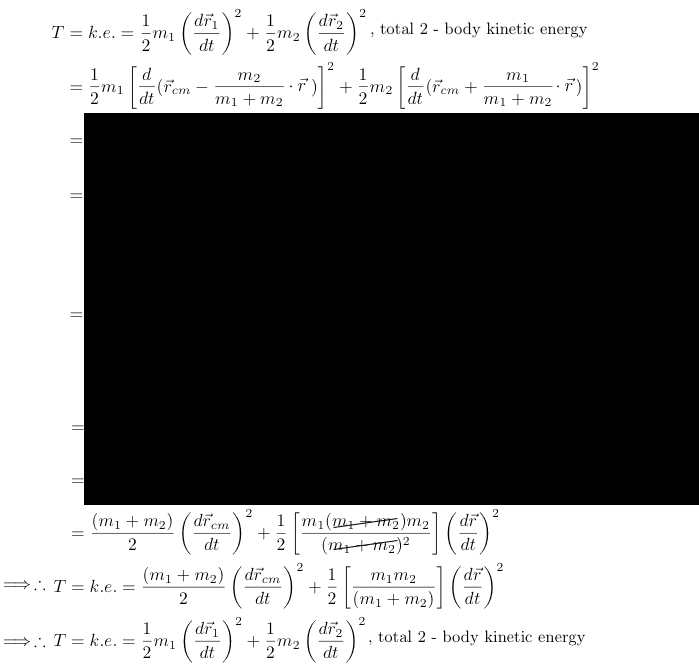 "New perturbative method for solving the gravitational N-body problem in the general theory of relativity", by Slava G. Turyshev and Viktor T. Toth, JPL - NASA, published International Journal of Modern Physics D, Vol. 24, No. 6 (2015), April 2, 2015 © World Scientific Publishing Company - DOI: 10.1142/S021827181550039X . Whereas finding a 2 - body solution of an unperturbed system is quite a simple task, however for a post - Newtonian solution of an N - extended arbitrary system of bodies this requires the application of Einstein's General Theory of Relativity ( GR ) which has now been accomplished as set forth in this 2015 JPL paper.